Syrah Based Wine from 90 year old vines! 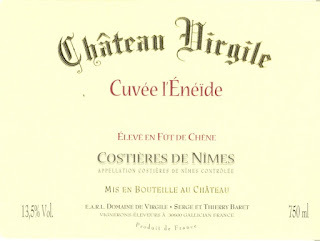 Tasting Notes: The “Cuvée L'Éneïde really shows off the great terroir at Château Virgile. The vines, situated at the edge of a plateau, produce a very dark and concentrated Costières de Nîmes. The nose is intense with cherry and black raspberry notes. In the mouth the wine is dense with rich black fruit flavors complemented by hints of black pepper and garrigue. The wine finishes with ripe round tannins. This is a crowd-pleasing wine, that is an excellent complement to classic dishes, like steak au poivre. Enjoy!